Ah, ’tis the season for hot days and even hotter BBQ’s! Warm weather, good company, and an awesome grill are the essentials, but we can’t forget about the supporting cast. That’s right — we’re talking about grilling utensils and add-ons. The use of advanced grilling tools and easy-to use extras can make your cooking experience a lot easier and help you deliver an epic barbecued meal for all of your guests. This Twin Eagles Griddle is a convenient surface that’s easy to attach and use with full-size grills and side burners. It’s made from 100% stainless steel and is useful for grilling breakfast, fajitas, stir fry, and everything in between. For the crucial post-grilling clean up, look no further than the Griddle-Q Cleaning Kit. This high-quality, stainless steel kit features high heat scrubbers that won’t deteriorate when used on a hot griddle, keeping it looking as good as new! The new Flame Boss 300 Universal Smoke Controller is the perfect gadget for controlling your smoker’s temperature, making your grilling experience that much easier, and your cooking more precise. You’re in control by monitoring your smoker and internal meat temperature from your smartphone or tablet. Plus, you can set an alarm and you’ll receive a text when your meat reaches the desired temperature using patented precise temperature regulation, allowing you to sit back and relax with a cold one while your smoker does the work — it’s as easy as that. If you’re planning on smoking a big cut of meat, the Grilleye Smart Bluetooth Grilling & Smoking Thermometer might be right for you. This device is the first worldwide probe to be certified by the FDA, allowing you to monitor and control temperatures from up to 300 feet away! Additionally, it has the capability to track the temperature of up to 6 probes simultaneously, showing both the current and desired temp for your meat. That’s a win-win all around. The HomeRight ElectroLight Fire Starter allows you to easily light your barbecue or fire pit, wood or charcoal in 2-3 minutes. Heating up to 1,300 degrees Fahrenheit, you’ll have no trouble firing up your grill. Because it’s chemical free, it eliminates any toxic taste or residue that can be infused into your food, leaving your meat as delicious as ever. 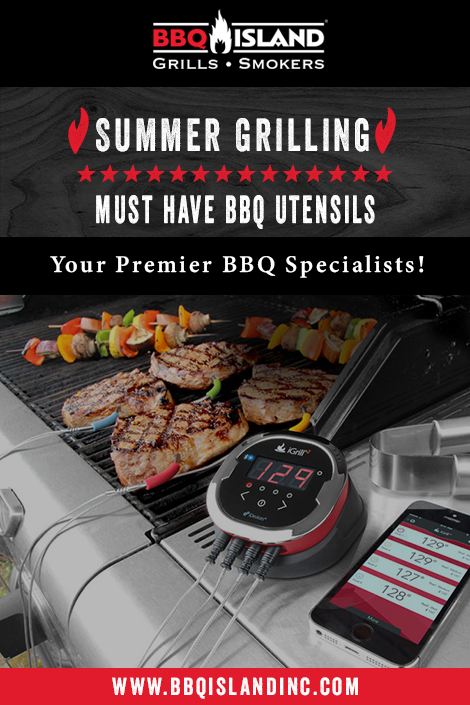 And just so things don’t get too hot, the iGrill 2 Bluetooth Smart Connected Grilling Thermometer allows you to monitor up to four temperatures directly from your smartphone device, ensuring that everything is cookin’ just how it should.